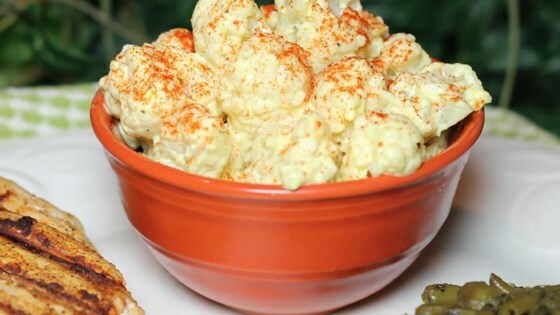 "Low-carb cauliflower salad that tastes just like a standard potato salad; serve chilled or warm." Place a steamer insert into a saucepan and fill with water to just below the bottom of the steamer. Bring water to a boil. Add cauliflower, cover, and steam until tender, about 5 minutes. Mix cauliflower, eggs, mayonnaise, dill pickle relish, green onion, mustard, salt, and pepper together in a bowl. Too much egg for my taste. Made it 2nd time with 1/2 the eggs and loved it! 3rd time I added diced celery and onion instead of green onions, and loved it even more. Hubby enjoyed it too! This was really good. I will def make again. I added a little bit of real bacon bits I had on hand for some extra flavor. Everyone really liked this.